Greetings, citizens of Tyria! 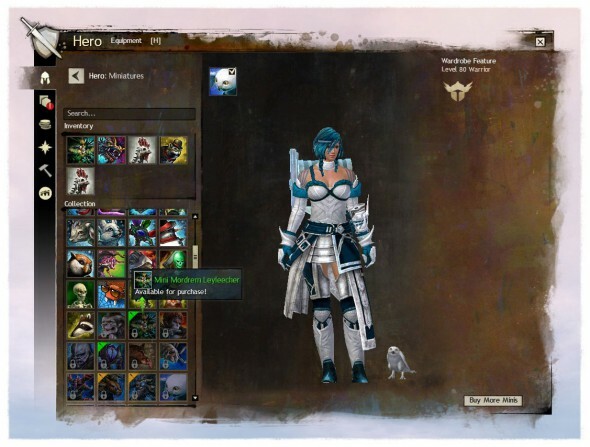 If you’re like me, you’ve greatly enjoyed exploring all the different looks available in armor and weapons since the release of the Wardrobe in our first April 2014 Feature Pack. With this next feature pack, we’re making it even easier to stand out from the crowd by updating the wardrobe with even more features! 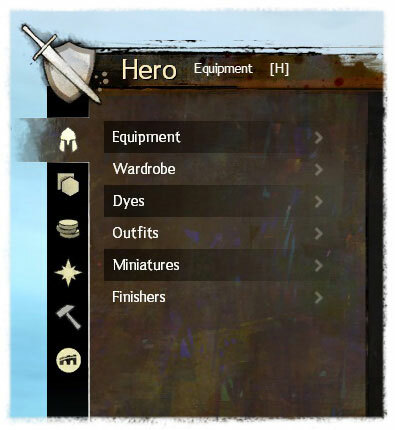 Firstly, we’ve added search capability to both the Wardrobe and Equipment sections of your Hero Panel, allowing you to even more quickly find the gear you’re looking for as your collection of options grows and grows. Right at the top of the Equipment grid, you’ll find a text search box that will filter available options by name as you type. The search will even keep your text active as you switch between equipment slots. This really helps narrow down the list when trying to find matching pieces for many different slots. We’ve also moved outfits to their own section, separate from equipment skins. We wanted to make it super clear whether you were customizing your equipped gear, which costs transmutation charges, or selecting a full-body outfit, which is always free. In the new Outfits section, you will now see all the possible outfits and be able to preview them on your character. This works for locked and unlocked outfits alike; both will be visible and available for preview, although we always sort the ones you own to the top. We’ve also added corner tabs to the locked icons which will keep you updated when new or limited outfits are available, or when something gets discounted for sales. “Well, that’s nice,” you say, “but what about finishers?” I have good news: we’re moving them into the Wardrobe as well to acknowledge them as proper character customizations and help you further make your mark on the world of Tyria—and on your enemies! The Finisher Panel has been completely reorganized to deal with the larger number of options now available and to feel much more like other character equipment options. Just like outfits and equipment, you can now search for a finisher by name and equip it into an active slot! Best of all, you can now preview finishers in the Hero Panel. When you open the Finisher view, your currently active finisher plays its animation for you to see. Below the search bar, you’ll see a grid showing all your unlocked finishers first, followed by all the locked ones. Every finisher can be previewed as often as you like. Want to compare the Super Explosive to Whump the Giant? Go for it! Dance battles between the Llama Finisher and the Quaggan Finisher? Yes! There’s no more need to search around PvP maps for opponents to test your moves on. The view scales to give you the best view of each finisher. You can rotate the finisher while it’s playing and even preview locked finishers, replaying them to find the ones you like best. I think you’ll be surprised at the variety of options available to you. We thought miniatures belonged in the Wardrobe too. Players have been asking for a mini-equip slot for quite a while, so we’re bringing that—and a lot more—to you in September! We’re making a lot of changes to the way minis are collected and stored at the same time to make things even better. Let’s start with inventory space. All minis can now be treated as account unlocks in the Wardrobe. The new mini section in the Wardrobe allows you to convert any mini in your inventory to an account unlock. Unlocking destroys the mini from your inventory, but once it’s unlocked, that mini is available to all your characters to equip simultaneously for no additional cost. Double-clicking a mini still works the same way. You can summon and unsummon any mini in your inventory. This does not unlock the mini for your account, however, and does not fully equip the mini. It’s just an easy way to see something in the world before you choose to unlock it. Possibly the biggest change with the new account level access to minis was moving the mini collections from the bank to the Hero Panel. Any minis currently in your bank or bank collection tab will still be in your bank when you log in. You’ll need to take them out individually and choose whether to unlock them for your account or dispose of them some other way. In order to make this easier, all minis of the same type now stack in inventory. You will no longer deposit minis into bank collections. Once a mini is removed from the bank, the collection space for that mini in the materials area of the bank will disappear. Those collections are being moved to the Wardrobe. 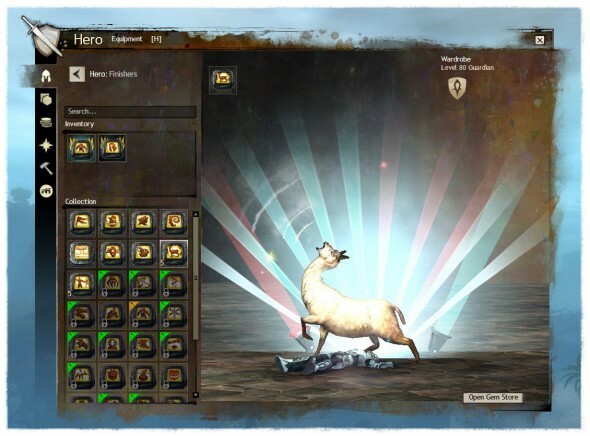 New achievements will also now be available for completing Wardrobe account unlocks for the series 1, 2, and 3 minis. In the Hero Panel, you’ll find all the options for minis that we have in other Wardrobe areas. Searching, equipping, and even previewing! At the top of the panel, you’ll find the search box again, which is great for tracking down where Scarlet or the Mordrem are hiding in your collection. Below that, much like equipment skins, you’ll see all minis currently in your character inventory. From here, you can summon them directly or unlock them for your account. Below the inventory list, you’ll see a grid of unlocked minis from your account. Account-unlocked minis can be equipped and swapped as part of your character by left-clicking them. Once equipped, there is a show/hide check box that summons and hides your currently equipped miniature. When shown, minis will appear next to you in every map you travel to with no further work necessary to deploy them. Lastly, a full list of available locked minis you might want to preview can be found below your account list. There are a few minis that remain hidden until unlocked, so we’ve still kept a bit of mystery in the world. Clicking on any mini, locked or unlocked, shows it next to your character on the right-hand side. You can rotate and preview the mini, seeing detail and size easier than ever before. Best of all, any mini can now be previewed from the Trading Post, inventory, and chat links! We hope you enjoy all the new features of your heroic wardrobe. I look forward to seeing you, and your minis, in Tyria soon.